Pat Kumicich uses a soft art to explore hard issues. While most people think of quilts as pretty, homey bed-covers, she chooses to use the medium as a means to work out her feelings, much as a writer might employ a journal. Consider the quilt she calls “Listen to Your Conscience,” one her self-portrait pieces. To one side is the half-face of a woman. But the centerpiece, the focal point that grabs the eye, is a soft, white, organza “ghost” whispering in the woman’s ear. Through the ghostly figure and behind her, are those hard issues – domestic violence, global warming, poverty and hunger. “Putting a Face on the Homeless” is equally hard-hitting. In the background are pictures Kumicich took during a visit to St. Matthew’s House, a shelter for the homeless. She then silkscreened the photos onto fabric. In the foreground is an appliqué figure of a man sitting, arms around his knees. But where his head should be, Kumicich sewed a round piece of reflective acrylic. The idea, she says, was to remind viewers of the thin line of Fate that often separates the have’s from the have-not’s. Kumicich came to her art form in 1994. Her daughter had just finished making a quilt and thought her mother would enjoy the process. 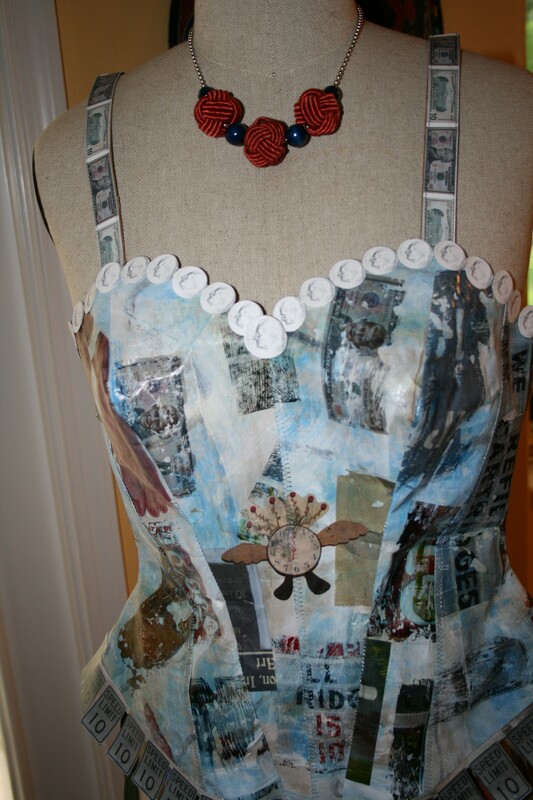 She started with patterns developed by others but soon found the need to stretch and come up with her own designs. That independent spirit is easy to see while looking at the various art forms Kumicich has pursued over the years. 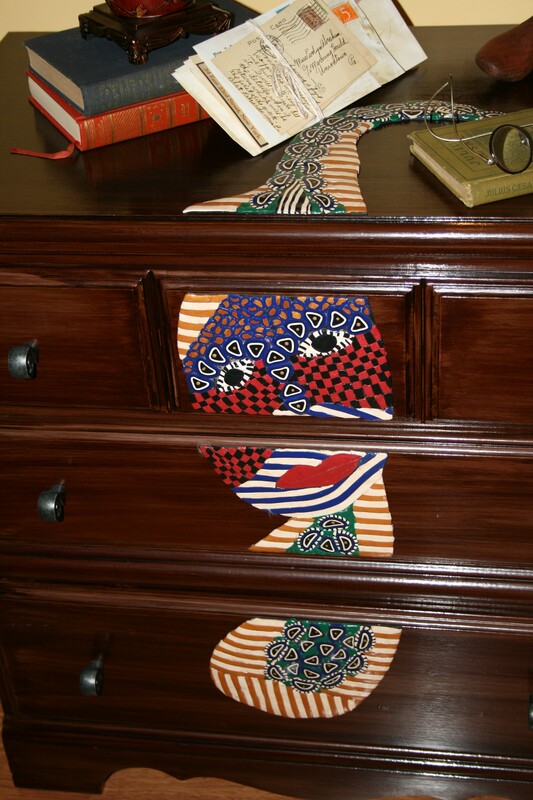 A small chest of drawers in her living room exemplifies her playful side, decorated as it is with a happy, mischievous polymer clown face. On a nearby dress form, a one-of-a-kind bustier she made for the 10th anniversary exhibit at the von Liebig Art Center sparkles in the light. Those things included pictures of dimes that adorn the edge of the bustier and miniature replicas of $10 bills, with her husband’s face in place of Alexander Hamilton’s. “It was different than anything else in the exhibit,” Kumicich notes with a laugh. And then there are the dolls – scores of them on the walls, shelves and tables. Call them her odds-and-ends pieces. Feet are made from old shoe forms. Limbs are often old rulers from her father’s carpentry days. Heads are clay or sculpted fabric. “They all have their own little personalities,” Kumicich notes. Kumicich begins with a phrase, a headline or something she’s seen on TV. Language gives her a title for the coming piece, which, in turn, keeps her focused on what she wants to depict. She begins by drawing her design twice (once to use as a guide; once to use as a pattern) and typically works straight through to the end. It is that sense of shared experience, shared sentiment and shared questioning that makes Kumicich’s work outstanding. Her technical skills are highly developed and admirable, to be sure. 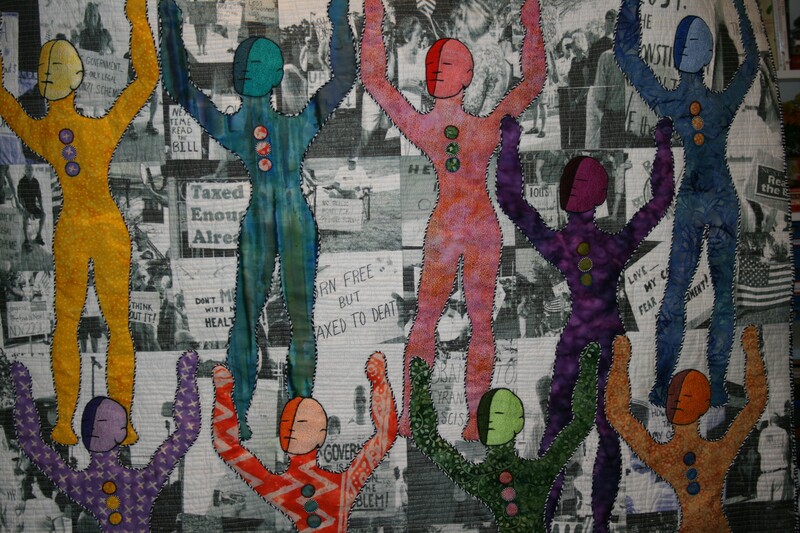 But it’s the impact one gets from viewing her quilt “paintings” that holds the gaze and lingers in the mind. The art world is starting to notice. 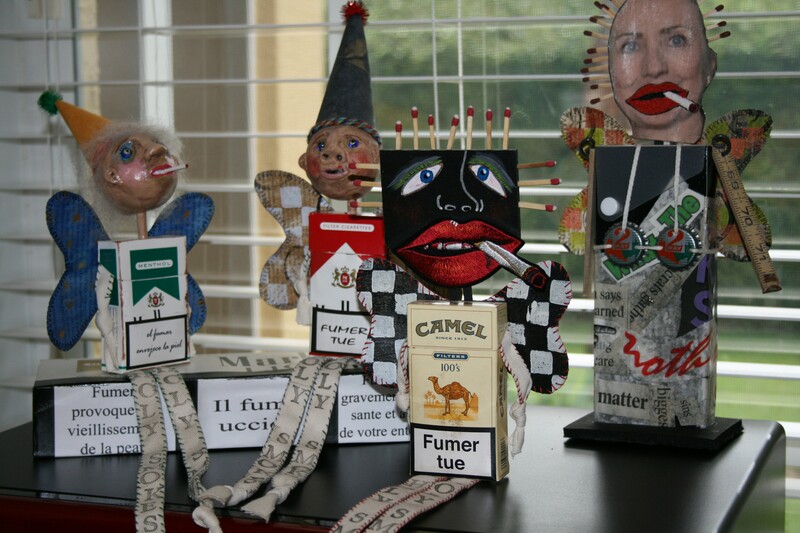 Kumicich’s “Quit Smoking” quilt won first prize in a Texas exhibition – the first time in 41 years the top award went to a fiber work. “Mama” won a competition that sent the artist to Provence. In 2009, Kumicich was included in the Phil’s annual Artist Studio Tour. One can only hope such a show will come to be. Getting lost in her soft world is an easy and gratifying journey. Pat Kumicich’s quilts are frequently featured in art shows locally and nationally. For a well rounded view of the quilts, visit her website at www.patkumicich.com. To arrange a visit to her Naples studio, email her at patkumicich@me.com or call (239) 775-9517.